Villa Bella Vista is located in a stunning position, Just off the edge of the hamlet of Kremithas above Kassiopi, offers stunning views across the countryside and over Kassiopi to the sea beyond. These views are especially impressive from the large partially shaded terrace leading of the living area which is ideal for a fresco dining. Bella Vista, A spacious and comfortable villa attractively furnished, with private pool. The pool surrounded by a 100sqm wooden deck and its terrace offers a built-in barbecue. During winter 2018 we have continued the villa improvements and the upper floor have been remodelled with two bedrooms (one twin and one double) with en suite bathrooms The new bathroom is really luxurious with calacatta marble on the wall and loads of modern lighting. We are really pleased with the results. All the bedrooms are equipped with an individually adjustable air conditioning. Fuel oil Heating System for winter moths with an extra charge of 30 euros per day. All Towels are provided included Pool towels. Change of towels twice a week. A big open plan living/dining area with one big dinning table, one coffee table, three big sofas, fireplace, satellite flat TV, Bluetooth speaker, Wi-Fi, Telephone for incoming calls. Fully fitted wooden kitchen complete with dishwasher, hob, full oven, fridge/freezer, microwave and espresso coffee machine. Notes on accommodation: Air-conditioning. Outside: There is a big shaded veranda with a barbecue corner and a swimming pool (9m x 5m). Utility Room: Washing machine, iron and ironing board. Cleaning / Towels / Linen / Maid service: Linen and towels are provided. Maid service 3 times weekly. Other: A large partially shaded terrace leading of the living area which is ideal for a fresco dining. Upstairs covered balcony. Would definitely recommend this villa. Fabulous views over the sea and Albanian mountains from all rooms (except one bedroom). Well worth the fairly steep, narrow 800m off the main road. Kremythas is a tiny, ancient village with no other villas we could see, quaint but with no facilities at all. Quiet and untouristy, you feel you are off the beaten track. Area superb - both Kassiopi and San Stefano gorgeous, within 10 mins drive and with every facility you could want. Villa is comfortable, clean and well-equipped. Both the owner and the housekeeper were super-helpful. This is not a modern, newly built villa (and the reasonable price does reflect this) so, whilst some areas have been modernised, there are parts which are in need of TLC: only 2 of the 5 shower units is wall-mounted, the wooden pool deck needs some knocking in of loose screws and some new furniture, as well as a bit of weed-killer. Villa is also not suitable for the very young or old - there are 35 stone steps down the outside of the building to access the pool deck and only the last few have a hand rail. We thoroughly enjoyed our time here. The villa is lovely, spacious (we were 2 families), the welcome basket was a nice touch. The views were beautiful, such a relaxing & quiet place. Karolos was friendly & very helpful, quick to respond to any queries. We highly recommend Villa Bella Vista. This was our first Villa holiday and wont be our last. Villa Bella Vista was amazing. The pool is stunning and the views overlooking Kassiopi really do take your breath away. The Villa was well maintained and spotless and it has everything you need for a great holiday. The outside area is great for BBQ and well equipped. 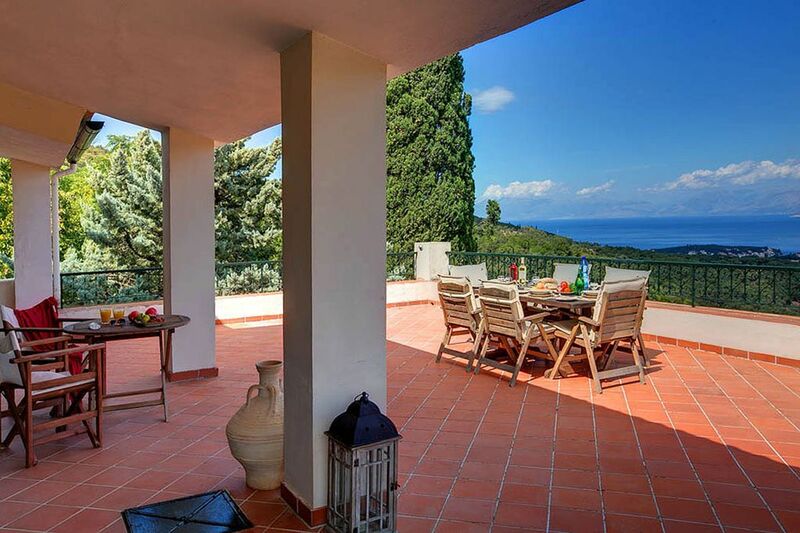 Villa Bella Vista is located around 32km north-east of Corfu town. Agios Stefanos and Kassiopi, are the nearest villages only 3km away and offer plenty of tavernas, restaurants, shops and bars.